The grasshopper’s cousin, the cricket, is a smaller but noisier relative. Unlike most grasshoppers in BC, crickets can be easily identified by their long antennae, dark brown or black bodies, and their ever-famous chirp. Crickets are very similar to grasshoppers in that they have a similar metamorphosis life cycle (they skip the caterpillar stage) and that they are more commonly spotted outside where the climate is hot and dry. Like grasshoppers, crickets are a symbol of good luck in Eastern cultures. Some cultures even consider crickets to be pets. Both they and grasshoppers are also considered to be food sources or a delicacy…even by us humans…there’s some real food for thought. 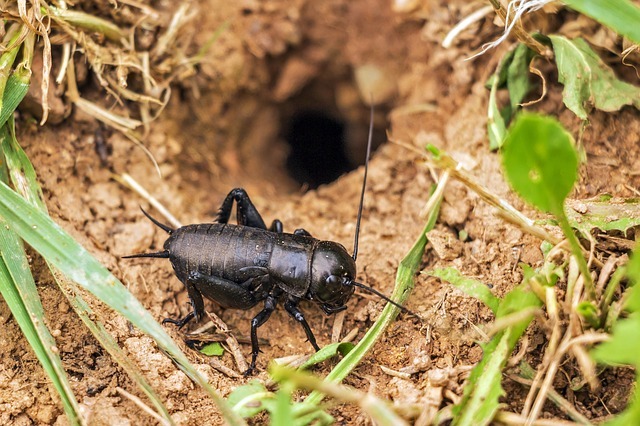 Hearing a cricket’s chirp coming from the walls or anywhere in a room where there shouldn’t be sound is usually a dead giveaway that something is wrong. Unless you own a lizard and feed it crickets, you shouldn’t be hearing them chirp from behind your bed in the wall! And like grasshoppers, crickets are herbivores that prefer to eat your garden’s plants, farming crops, and even trees and leaves. Whether you’re hearing crickets after a bad joke has been told or they’re waking you up way too early in the morning, having a cricket infestation cleared out may be needed. If that’s the case, call your local Pest Boss. We’ll get you, varmints!